Fabric loading capacity 20 Kgs up to 500 Kgs. Pressure Vessel and all wet part machine made of stainless steel AISI 316/316 L, highly corrosive resistance. The fully folded nozzle and nozzle diameter up to 60 to 95 mm. for manmade fabric. High fabric speed up to 400 m /min. Liquor ratio 1:1.5 to 1:2. A mirror polished fabric transport perforated basket for easy trouble free movement of fabric from back to the front of machine. The perforated basket is fabricated in such that welded part does not come in contact with the fabric. 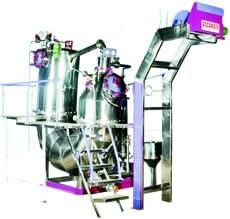 Heavy duty low rpm & high rpm pump which consume low power & high discharge of liquor.